Gina is a wonder dog with a sweet loving personality. Candy Cane is playful and eager to please. Dams: Betty, Pat & Ally These little girls come from healthy lines and sweet temperaments. Right now they are just puppies having a great time playing and learning. They aren't interested in having me take their picture and they want down to play. Who have a special place in our hearts. 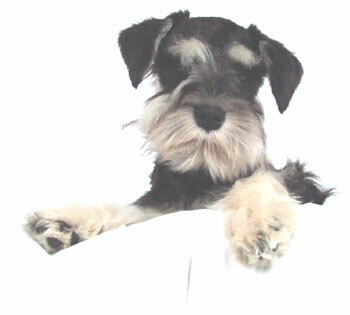 Georgie Girl, Salt/Pepper Girl with her natural floppy ears, very playful and loved teasing the rest of our dogs. 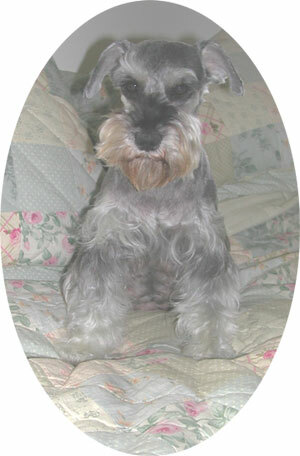 This is Toots daughter of J.J. and Georgie. Toots is Salt/Pepper and has cropped ears. She comes from very healthy champion lines. Cookie, Coco and Cinders retired young. We placed them in loving homes. Coco and Cinders were from the same litter. Bitzy lived here until she was four. I called her my little show off. very playful, smart and got along with everyone here. Penny melts my heart. She is my champion. Very square in build with a soft silky coat. Very playful. She went to a pet home very young. I still miss her. 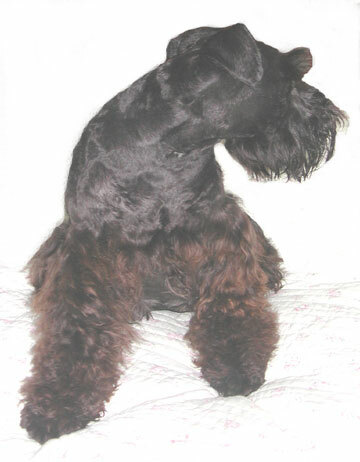 These girls (retired and in pet homes) came to me from a wonderful show breeder in New York. They are so sweet and cooperative. Nothing like good breeding! Layla our little ornery Salt/Pepper girl who was retired young and now lives in Tennessee. Layla is a happy girl and always smiling. Her BFF was Hanna. Bea, daughter of Maxi and J.J. went to a loving pet home. This little Lady with the floppy ears loves to play......and teasing Landry is her favorite thing to do. 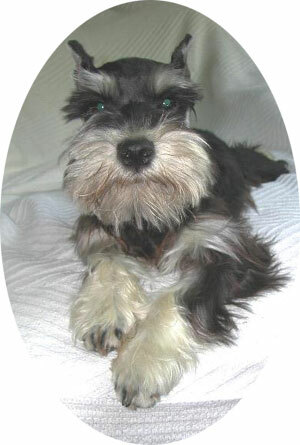 She looks Black/Silver in color but is really a dark Salt/Pepper. 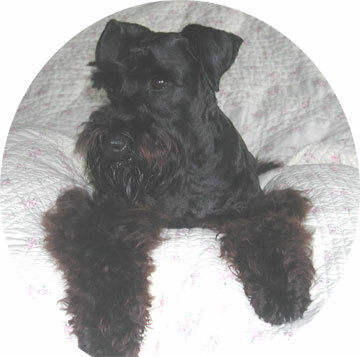 Bea's square in build, nice tail set, has a very thick coat and loves to cuddle as all our dogs. Hanna retired at a young age. We don't breed females that have a rough time when whelping. Tatum and Susie were born here. They couldn't have been more playful or sweet. Peggy Sue....sweet and just a little girl. Our Black Champion sired Dam: Peggy Sue. Hi Cathy and Mike, I cannot begin to thank you enough for these two wonderful children! fitting harnesses the other day. They were absolute Rock Stars! Everyone there fell in love with them. first ride in their car seat. They must like it because as soon as they got into it they went to sleep until the car stopped. and also pretty good with a brush and comb so they really like to be with him most. I’m just the “go-tto” person when you’re hungry! the center of our lives. They have a wide assortment of Aunts and Uncles who have to come and check on them, so they never lack attention. I’ll try to get some pictures later today for you. Carol P.S………the bed Cliff got for the two of them……well, Boo claimed it right away. Whisperer with us……..growling if the tv dogs get loud! Bella has another bed on order now. Miss Mini: our very first. 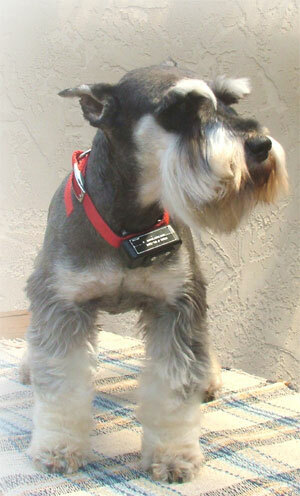 Salt/Pepper Miniature Schnauzer female. and run in all directions. She has always been loving and patient. families 16 year old son. I have claimed him as my new master and what a super choice! I get to sleep on his big comfy bed with my head on his pillow next to his every night. before and I even had a bite or two of a McDonald's hamburger without the fixins'. My new family has a couple of cats and we have had our differences but we can play together now. I have claimed an overstuffed pillow on the couch and will sleep for hours curled up by the fireplace. 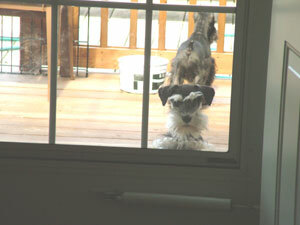 The other two dogs, the Lab mix and the other mini schnauzer have accepted me with open paws. However, the loveseat gets a bit crowded with all three of us taking our siestas at the same time. car ride home as I slept on my new Mommy's lap all the way home on a cuddly pillow. I will dig in the snow and create quite the mini blizzard so we both enjoy being outside. Dad calls me up on his lap a lot of times to snuggle - he has a very warm and soft belly. Our CH. 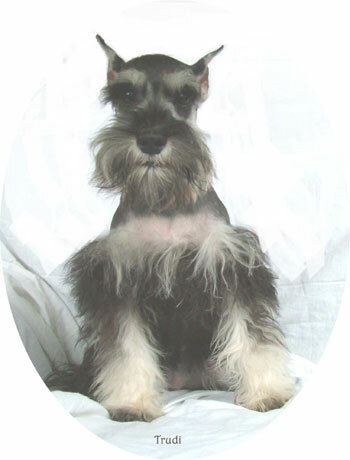 Sired Black/Silver Dam: Maxie This dog almost takes my breath away. square in body, has a short straight back, a great tail set and smart as a whip. Maggie Mae: Retired and here to the end. This little Black/Silver girl is the love of my life. 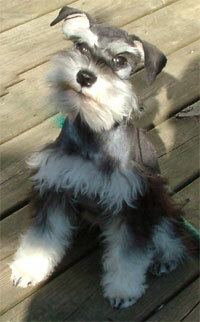 Even though Maggie needs a bath, she's still the cutest little schnauzer with the sweetest temperament. When I went to look at her for the first time, I left my pocketbook in the car. But it only took one look to melt my heart. I ran as fast as I could to get my purse and I have never been sorry that I did. Fancy loves to dress up. And looks good in all her clothes. Lady Sadie: Now retired. Sadie was a great mother always gentle with her puppies and humans. days with my three year old and her. My three year old wanted to hug her too tight and Sadie didn't care for that. and likes to ride on the boat. We took her to the lake last week and she ran around in the shallow part of the water. a race between the two on who was going to get the toy first. Sweetie got to the toy every time first, but Sadie never gave up. Happy Easter and God Bless you and your family. Ruedee Jane: Retired at age three. 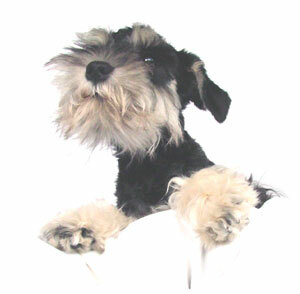 What can we say about our Salt/Pepper girl Ruedee Jane? 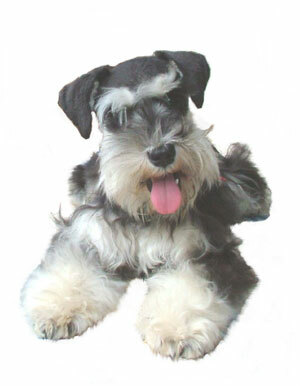 Ruedesheim's Dream Chaser from Glojan Kennel. Ruedee is much the little pest in our kennel. She loves to tease and play keep away when no one else wants to. This gets Ruedee into a lot of trouble. Ruedee is smart, playful and always eager to learn new things. Ruedee Jane would love to compete in agility. 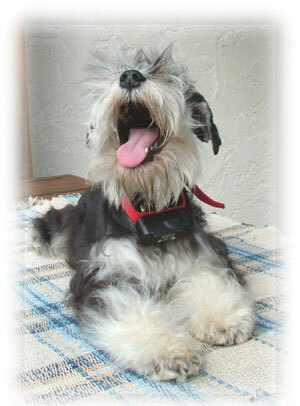 This was our little Trudi girl. Suzie is retired and lives in Ohio. Ashland's pedigree. Ashland went to live Southern Ohio. We miss her so much. This is Lacie. Lacie went to live in VA with Beth Weaver. 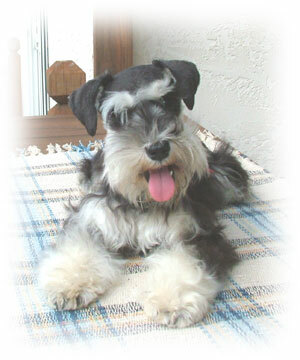 Our Toy Black/Silver Dam: Jilly Bean is the daughter of Herbie and Maggie Mae. though she is full grown. Of course, she has that same sweet temperament just like her mother. Jilly is here as our pet forever! Jilly just didn't want to have her picture taken. Sniff, Sniff. I think I need a bath. She got a little PO'd when I groomed her.